Exotic Ocicat Kittens ..... JumpnSpots is ready to assist you in finding your new best friend. Contact us for more information on acquiring a kitten at JumpnSpots@GMAIL.com. Champion JumpnSpots Athena Black Magic was awarded best ebony-silver Ocicat from TICA (The International Cat Association) in 2010. Zoe and Stella, sisters living with Brian have made a beautiful picture while looking through the skylight at the snowflakes landing above them. Simply Beautiful! Welcome to JumpnSpots of Southern California. We are located less than an hours drive north of Los Angeles and an hour south of Santa Barbara. We specialize in the the exotic spotted cat with personality! 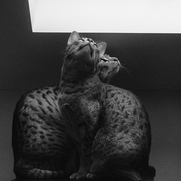 JumpnSpots has been breeding Ocicat kittens for over 10 years. JumpnSpots is a small cattery, specializing highly social, beautiful and healthy spotted kittens. We proudly offer the elite, exotic Ocicat kittens of JumpnSpots. We regularly have Ocicats in Chocolate Spotted, Chocolate-Silver Spotted, Tawny Spotted and Ebony-Silver Spotted colors. On occation we will have Cinnamon, Cinnamon-Silver, Blue and Lavender-Silver spotted kittens. Our kittens and cats have the run of our house and are introduced to our German Shepherds very early in life, making our cats great around dogs. They are also socialized with many people, especially children of all ages. Our Ocicats come from purebred, championship lines, and are CFA and/or TICA registered. We hand raise our kittens with children, dogs, and lots of love. Above is Honey Nugget, my beautiful Hot Chocolate Spotted Queen. This is Sebastian, an Ebony-Silver Spotted Male who modeled outside in the fern bed for Astrid! Above is Zoe and Stella two JumpnSpots kittens who live in Rhode Island with their owner, Brian. Brian bought two kittens at different times and now these two babies are life long friends. They play, sleep, and eat together! This is an ebony-silver spotted and a chocolate-smoke ghost spotted kitten, happy in their new home. Joy is when more than one kitty wants to sit on my lap at the same time. Here is Lilly Rose and one of our Chocolate spotted babies snuggling with me, Stacey, Owner and Operator of JumpnSpots Ocicats. Thanks for taking time to look at my website and I look forward to hearing from you!